At the time of this writing it would be exactly three months since my trip and I am afraid it was no longer vivid in my memory that I really need to write it now. It’s Christmas eve for most people but for me it’s just an ordinary day and so I am blogging. 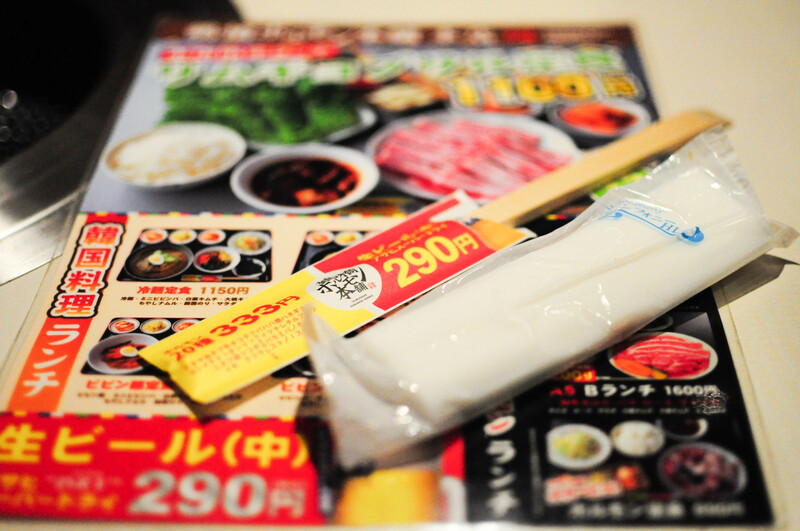 For only 1050 yen, We had 삼겹살. It’s a famous Korean dish and is really one of my favorites. The food is pretty good and I was full after but be prepared to smell like charcoal after. After a satisfying lunch, we headed to Tenjimbashi-suji as it was recommended for cheap shopping. 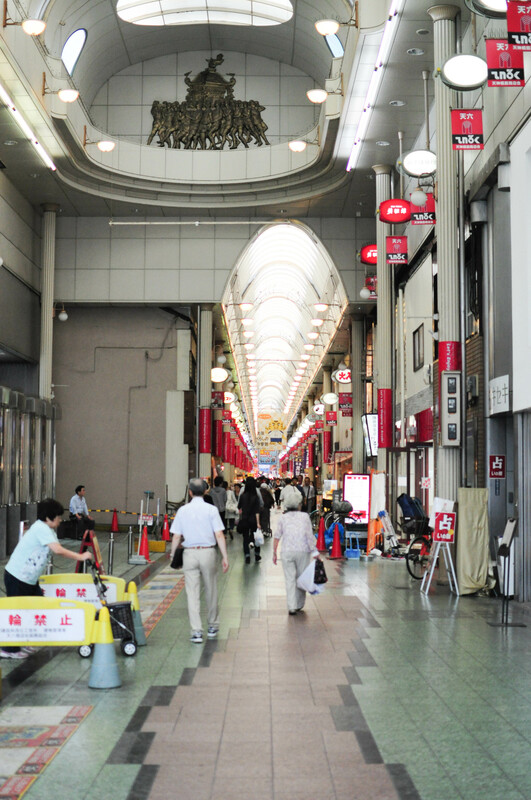 Shopping streets in Japan all look fairly similar. You can always expect one long street of individual shops lined-up. I think it’s actually pretty cool than going to the mall and have to go round and round trying to find shops. At least, a single line will ensure you that you won’t miss any shop as you pass by. 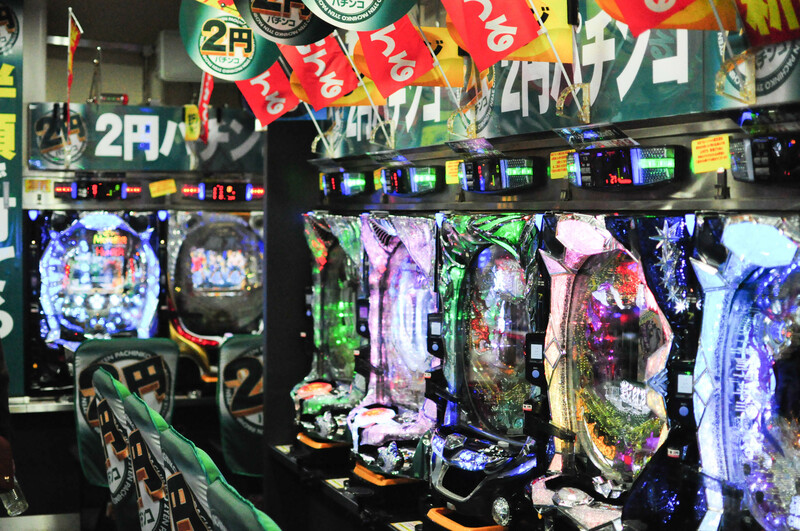 Another interesting find in Japan are their numerous arcade shops, well they are not really arcade shops because you have to shell out a lot of money to keep playing. You will see a lot of old man playing what seems like pinball but not really it. We pretty much spent the whole day shopping until our feet can walk. 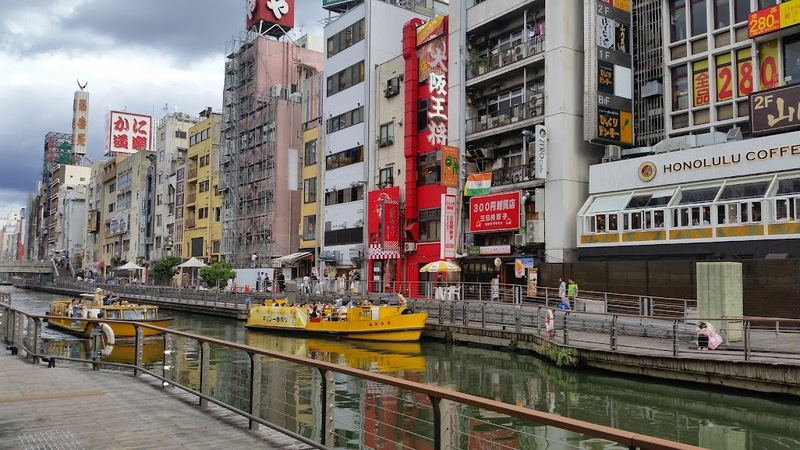 If you are looking for cheap souvenirs from Osaka, you might as well find it here. For the shoppaholics, shopping might be easy-pissy but for us it’s totally hard. It was hard to get up the next day from all the walking. Thank God I bought a really nice pair of comfortable sneakers or I’d die from all the walking we did. Fifth day’s highlight was the Shitennoji Temple. If you are not aware of it, it’s the oldest shrine in Osaka and you might as well notice from the picture below on how old it is. 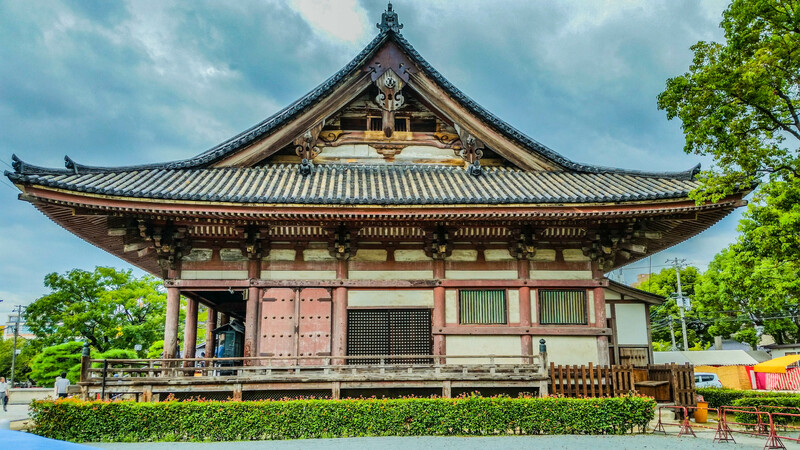 You can easily access this temple via the Shitennoji-mae station. It’s just five minutes walk from the station. We got a free pass inside the shrine not because of the Osaka Amazing pass but because there was a Buddhism ceremony so it was free. Yay for us! On a normal day the entrance fee is 300 yen. I think this temple is a must go if you are in Osaka as this resembles one of the Japanese culture. The structure’s architecture was magnificent and the whole area was really well planned. Then I wondered, how come we don’t have such places like this. When we had enough of the shrines, relics and old stuff, we were off to Shinsaibashi-suji for some premier shopping (coz you know we have to). Oh well, it’s another long street of all the expensive, luxurious brand you can imagine. 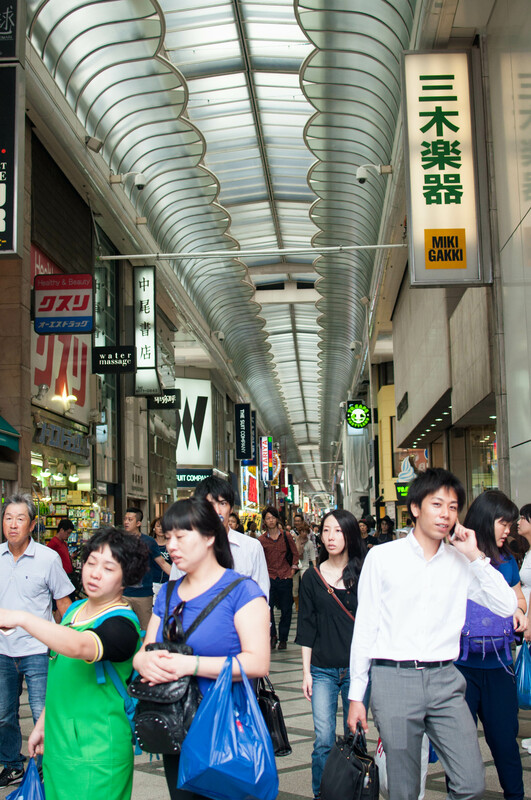 At the front of the shopping street, you will be welcomed by UNIQLO and H&M. Why do they always have to be in-front or beside each other? The best thing about Shinsaibashi-suji? There’s free wifi. Hahaha. I should’ve really got a Docomo wifi so that I am not searching everywhere for wifi. And this year you might have heard about.. Hello Kitty’s 40th anniversary and yes Hello Kitty is not a cat. 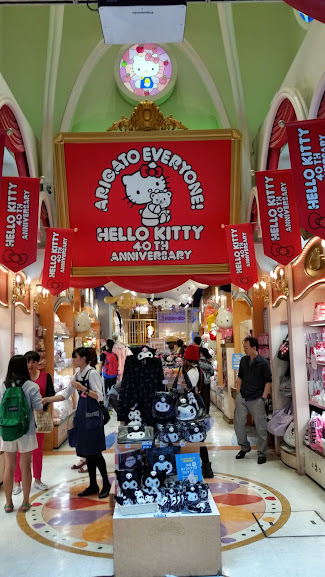 You will find a lot of store dedicated to Hello Kitty here but just be ready for your money to be taken away. Haha! Now I know why the lady we met in Tsuruhashi told us about Shinsaibashi-suji, that you should dress well when you go there. There’s only a slim chance for you to find a cheap item there. However, there’s one thing I noticed about the Japanese. Back in my home country, if you don’t dress well and walked into a high-end shop.. You will get quite a stare and be snobbed by the sales lady. But in Japan, tho I was just wearing casual outfit, I never get to experienced to be snobbed. They were actually very enthusiastic about selling their products to, which makes me to really wanna buy the Samantha Thavasa bag only if it won’t cost me a fortune. 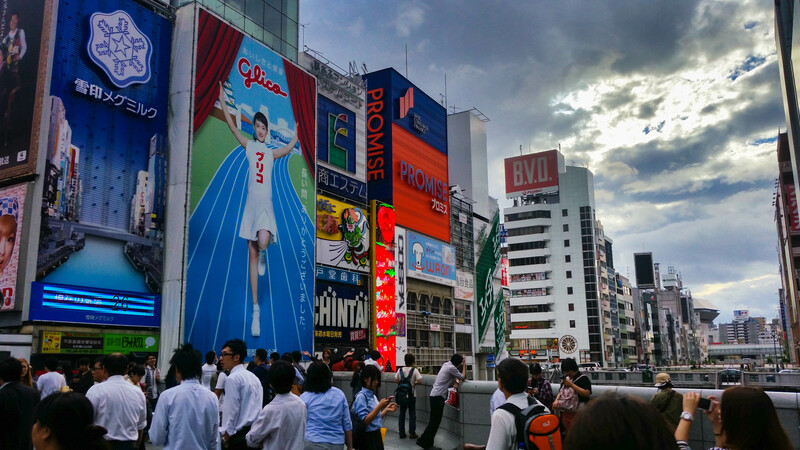 At the end of Shinsaibashi-suji, you will be welcomed by the famous Glico billboard and apparently when we visit it was being fixed. It was replaced by a Glico girl. After Dotombori, we went back to our hotel and last minute went to the Hankyu Department store at Umeda. 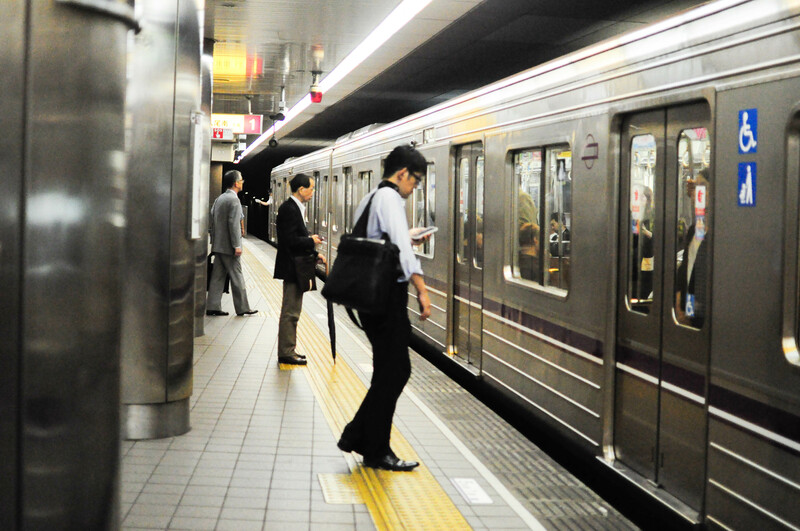 Good thing we purchased the one-day unlimited subway pass for 800 yen which made us save some yen. You can spot Matsuya from this street which was my favorite Gyudon fast food chain. The food was priced reasonably and it taste good (at least for me), especially the rice. We weren’t able to try the HEP 5 ferris wheel because we got there so late. 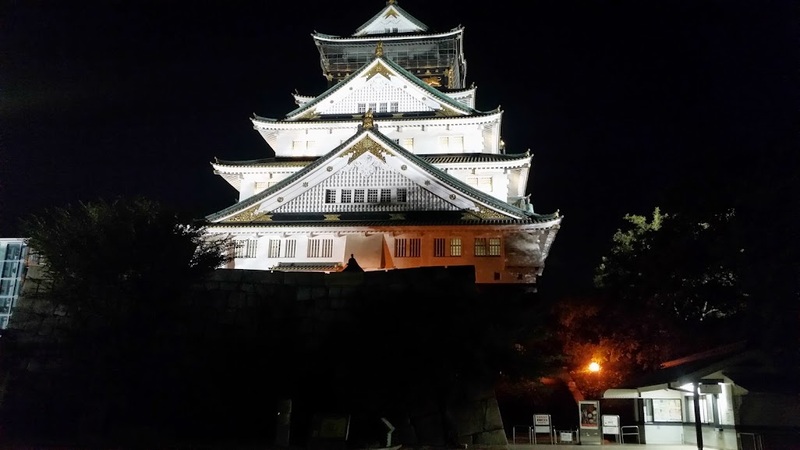 So we only did some strolling around and went back to Temmabashi around 22:00 where our feet led us walking to the Osaka Castle. It’s kind of creepy walking at night. The place looks kind of eerie at night especially the outer moat but it was such an experience and the weather was good too (a chilly kind of night). We spent the rest of the night walking around the castle before resigning to our hotel rooms. 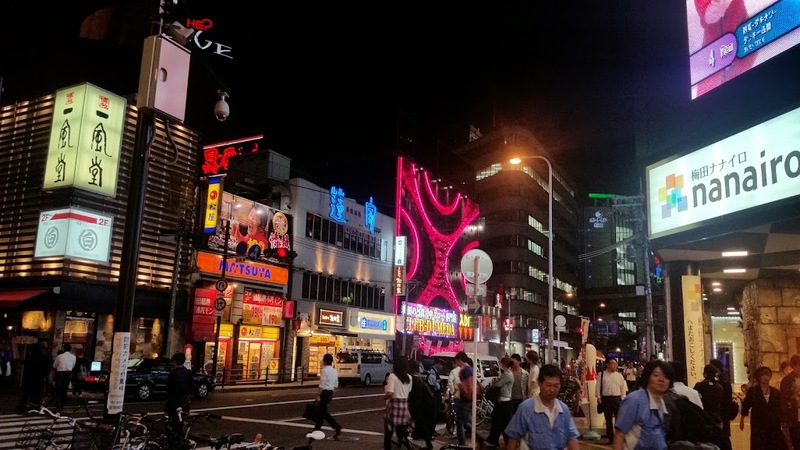 Reminiscing about my trip to Osaka makes me want to travel more and experience other places. Travelling opens you up to different perspectives. I will write about the last two days of my trip before I head of to Subic for the New Year.